Today is Earth Day, a day designed to inspire awareness and appreciation for the Earth's environment around the globe, both on a political and public level. The organisers of Earth Day have a number of goals. However, their main goal is to "change the politics not the climate", lobbying politicians around the world to the consider impact on the natural world of their economic, industrial, developmental and environmental policies. It was actually on this day 40 years ago, that over 20 million Americans took part in the first Earth Day rallies and teach-ins which ultimately led to the passing of the Clean Air and Clean Water acts in the US and creation of the Environmental Protection Agency (EPA). But it must be asked, how does Earth Day affect political thinking today and will it be as successful as it was in the past. Earth Day 2010 takes place mid recession and the political climate has changed considerable since 1970. With a battered world economy making it harder to build support for policies that could raise prices, cost jobs or slow economic recovery. Are today's issues (global warming, ocean pollution, alternative energies) less relevant to the general public than clean air or clean drinking water - the issues back in 1970? 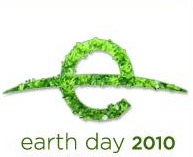 For more information on Earth Day 2010 and to find out what you can do, visit their website. By the way, Google have changed their logo in support of Earth Day, which is a little pointless and slightly hypocritical as Google is an extremely power hungry operation. It would have made more sense if they had changed their background display to black - thus conserving energy. The Guardian Newspaper reported last May that one Google plant in Oregan can use as much power as the city of Newcastle in one day. Click here to read the article.